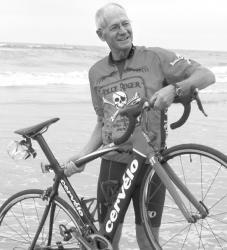 Retired Florida Man Bicycling From OB to East Coast to Aid Gulf Coast Oil Spill Victims. Roger Grooters of Gulf Breeze dips the rear wheel of his bike in the Ocean in Ocean Beach on Sept. 10. A Gulf Breeze couple is riding across America in support of the families who are victims of the Gulf Coast Oil Spill. In recent years, the Gulf Coast has been slammed by hurricanes, recession, and now the largest oil spill our country has ever experienced. The cumulative effect of these disasters has caused extensive pain and suffering. Feeling an obligation to help their brothers and sisters in need, Roger and Vicki Grooters of Gulf Breeze embarked Friday, Sept. 10 on a cross-country ride. Roger is riding his bicycle from Ocean Beach in San Diego, Calif., to Jacksonville – a distance of approximately 3,200 miles. Vicki is providing the physical and psychological support. “Our communities are experiencing growing numbers of homeless (including children), housing foreclosures, personal and business bankruptcies, divorce and suicide,” Roger Grooters, retired executive director of Cox Communications Academic Center for Student Athletes, wrote in one of his daily blogs. On Tuesday, the Grooters were in west Texas near El Paso. Any and all donations are appreciated, and 100 percent will be used by families in need. Donations can be made to assist victims of the oil spill through a special account set up through the Gulf Breeze United Methodist Church. Make checks payable to Gulf Breeze UMC, 75 Fairpoint Drive, Gulf Breeze, 32561 with “Oil Spill Response” in the memo, or go to www.gbumc.org and click on the red “Give Now” button. Then fill out the form with “Oil Spill Response” in the “other” category. Follow Roger and Vicki Grooters’ adventures at his daily blog: http://rogerxcountry . Roger was killed today while riding his bicycle to in Bay County on his way to Jacksonville. This is a sad day. It is indeed. Our hearts go out to his family and friends. Kim, we here at the OB Rag are also truly saddened by this tragic news and Roger’s tragic death. Do you have any more details?